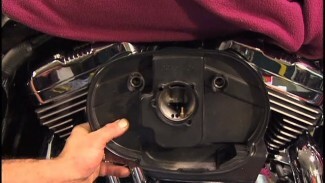 Removing the stock oil pan from your Harley is not a difficult task but there are some things that you should be prepared for before you start. We are removing this stock oil pan in anticipation of installing a Baker 1.5+ oil pan assembly. The Baker instructions are straight forward, clear, and specific but it is also important to have your factory service manual available for reference. 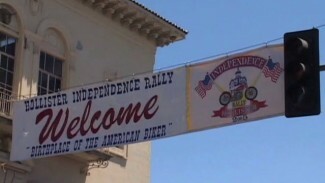 As Bob mentions, it is not necessary to remove the rear wheel, or any part of the motorcycle’s primary drive. We only have them removed in these videos so there can be a clear view for demonstration purposes. The rear of the motorcycle needs to be lifted but it will not be possible to remove the oil pan if the flat jack is across the rear cross member. Baker recommends lifting the motorcycle from beneath the motor using a flat jack across the frame and two lengths of wood blocks (2X4’s – 2X3’s – furring strips) along the frame, on each side, length wise. Drain the engine oil and transmission oil from the motorcycle. It is nice if you can remove the drain plugs and let the oil drain over night so the oil pan will be almost completely evacuated of oil. Remove the oil fill plug/dipstick. If it is left in, it will obstruct the removal and may also break in the process. Loosen and remove the oil pan retaining hardware. There are twelve screws total. They will not be reused. The screws are 1/4″ allen head and can be removed with a 3/16″ allen bit or ball allen. Once the twelve screws are removed, you will be able to slide the stock oil pan toward the primary drive side and back out of the bottom of the motorcycle. The stock oil pan will slide out fairly easy but now, with it out of the way, it is important to get a close look at the rear frame cross member. If the cross member has been bent upward from bottoming out or incorrect jacking, it will now need to be straightened out before attempting to install the Baker oil pan assembly. The Baker assembly will not otherwise fit. Inspect and clean the gasket surface at the bottom of the transmission. The motorcycle is now ready for the new oil pan installation.